Coffee House Press, 9781566895132, 132pp. Leaping from ballet to quiltmaking, from the The Nutcracker to an Annie-B Parson interview, Idiophone is a strikingly original meditation on risk-taking and provocation in art and a unabashedly honest, funny, and intimate consideration of art-making in the context of motherhood, and motherhood in the context of addiction. 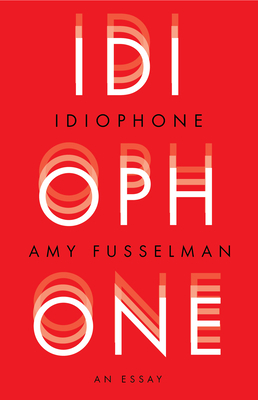 Amy Fusselman's compact, beautifully digressive essay feels both surprising and effortless, fueled by broad-ranging curiosity, and, fundamentally, joy. Amy Fusselman is the author of three previous books of nonfiction. She lives in Manhattan with her husband and three children.